The stately Annapolis is the first release in the Explorer's Collection series of limited-edition globes. This 20" diameter illuminated globe features a hand-applied, hand-cut map showing over 4,200 place names. The Annapolis arrives accompanied by the most current edition of the World Atlas Executive Edition by Hammond World Atlas Corporation, with hundreds of pages of geographic, cultural, and environmental facts and images. 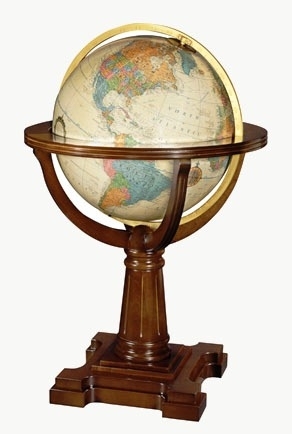 The Annapolis sits atop a distinguished, dark walnut-finish hardwood stand, the perfect platform for displaying the limited-edition number plate that identifies your globe as one of only 500 made. Proudly handcrafted in the USA.